With strong rumors circulating that FC Krasnodar striker Fyodor Smolov is set to make a £15 million ($20 million) switch to Premier League side West Ham United, RT Sport gives you the lowdown on the Russian target man. Fyodor Mikhaylovich Smolov currently plays his club football for FC Krasnodar, located in the Southern Russian resort town of the same name. He was last season’s Russian Premier League top scorer with 18 goals in a side that finished fourth to ensure Europa League football. In all, Smolov scored an impressive 31 goals last calendar year for club and country. Many observers believe the 27-year-old must venture further afield if he is to realize his unquestionable potential. In the summer, a move to current Russian champions Spartak would have seen him make a step up but didn’t materialize. He was also said to have been a target for numerous Spanish clubs and was reportedly eyed by Borussia Dortmund as a replacement for Pierre-Emerick Aubameyang during the Africa Cup of Nations. 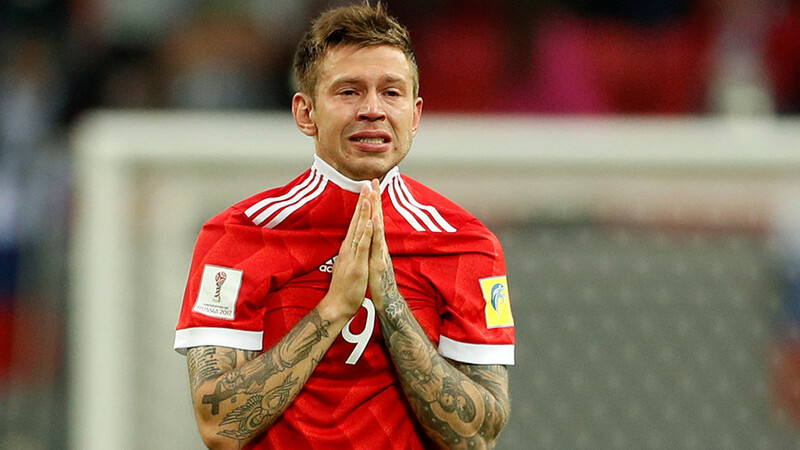 Russian national team manager Stanislav Cherchesov would prefer Smolov to try his luck in Europe, and wants the player to be fully fit and playing regular football at the highest level ahead of this summer’s Russia 2018 FIFA World Cup. If that is the path Smolov chooses to take, it would not be the first time he has played in Europe. The striker began his career as a teenage prospect at Dynamo Moscow, where he was loaned out to Dutch side Feyenoord in 2010 and, although it provided the then 20-year-old a taste of European football, he failed to net a single goal in his 11 appearances, picking up a hamstring injury to boot. The young striker then went on two further loans to Russian sides Anzhi and Ural, without much success and upon returning to the capital, he failed to make a big enough impact to hold down a first team berth. Smolov moved to Krasnodar in 2015, where he has since established a reputation as Russia’s leading light, scoring 59 goals in 90 appearances, and is widely considered to be the league’s best player. Smolov is a clever and composed forward, an old-fashioned number nine who can lead the forward line and finish with either foot. He is also an accomplished English-speaker, a rarity among the Russian players, having conducted press conferences in the language on international duty. With an asking price of £15 million ($20 million) West Ham might think the gamble is worth taking. Given that Mexican striker Javier Hernandez may make the move away from East London this summer, along with a £10 million ($14 million) kickback for the outgoing Diafra Sakho, a punt on Smolov may make even more sense. Smolov led his country’s line at the 2017 Confederations Cup last summer, and has amassed 28 appearances for ‘Sbornaya’, netting 11 times. His most recent international goals were an impressive brace against Spain in the friendly at St. Petersburg’s state-of-the-art stadium on Krestovsky Island, beating David De Gea with a left-footed strike after a clever turn and then a right-footed bullet to the top corner from the edge of the area as Russia earned a 3-3 draw. Already a national icon, he endeared himself further to the nation by agonizingly shedding tears when his country were knocked out by Mexico in the Confed Cup quarter-final in the same vein as Paul Gascoigne at Italia ‘90. Off the field, Smolov’s private life has also been the center of much speculation, due to his 18-month marriage to the stunning Miss Russia 2003 Victoria Lopyreva. The couple wed in 2013, but broke off the marriage when both of their careers began to put a strain on their relationship. The pair reportedly remain on good terms. Now a FIFA Ambassador for Russia 2018, Lopyreva is probably more well-known among English football fans due to her connection with Manchester United. The blonde former TV presenter warmly welcomed United fans on their European visits to Russia last year and in return made a couple of appearances at Old Trafford. Smolov could eclipse his ex-wife’s popularity should he complete the move to West Ham, which makes sense for club and player. West Ham would take a necessary gamble on a highly-rated player to replace an outgoing striker, while for Smolov it would represent probably his last opportunity to play his best football in a top league. With his home World Cup just months away, the chances are he would seize it with both hands.